33750 N Dove Lakes Dr.
Dove Valley Ranch is located minutes north of Scottsdale, Arizona in the city of Cave Creek, where open desert lies and wildlife roams. 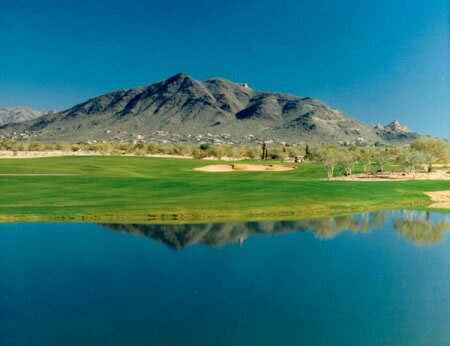 Designed by Robert Trent Jones II this Arizona golf course offers a landscape that will dazzle golfers of all levels. Layers of golden desert circle throughout the golf course. The front nine plays wide and forgiving with a little desert off to each side of the fairway. Women golfers especially love the fact that there aren’t many long carries on the course. The back nine; however, is quite different. The course becomes a plethora of challenge with target golf combined with narrow fairways and desert carryovers. True to its desert form, the course naturally follows the lay of the land. Set in the foothills of Black Mountain, elevation changes are minimal. Enjoy 360 degrees of mountain views and desert vegetation such as Saguaro, Ocotillo, Ironwood, Palo Verde and Cholla make this golf course a hidden beauty. From Phoenix Sky Harbor Airport: Follow the airport signs to the I-10 W. Merge onto I-10 W. and continue for 3.7 miles. Merge onto AZ-51 N via exit # 147. Continue 16 miles. Merge onto Loop 101 W. via exit # 15B on the left. Continue 1 mile and exit Cave Creek Rd. via exit # 28. Turn right on Cave Creek Rd. and continue 8.4 miles. Turn left on Rancho Paloma Dr. Turn left onto N. Black Mountain Pkwy. Follow signs to the golf course.